Lawn Maintenance is a key component of our business. We offer many different 12-month package deals that include (but are not limited to) regular lawn cutting, machine trimming, hand trimming, fertilization, etc…. We will build you a package that can incorporate any aspect of your property to keep it the envy of the neighborhood. Throughout the years of installing landscapes, many homeowners want to know how to keep it looking as good as it does after we leave. Well, the answer is simple. 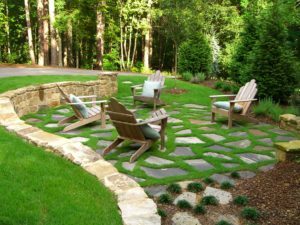 Let us maintain your landscape in a way that will enable you to enjoy that landscape without ever having to worry about it. We tell many of our Clients that we are “Selling Saturdays.” This is true because when you have us come out and take care of all the maintenance, all you have to do is sit back and enjoy!